the use of sarin gas alone would produce 1 million casualties. 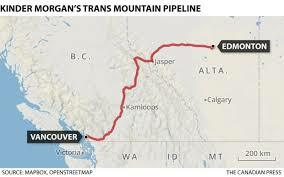 This is a very controversial oil pipeline that runs from Edmonton to Vancouver. This pipeline was built in the 1950s by Kinder Morgan in order to bring oil from Alberta to British Columbia when large oil deposits were discovered. This pipeline had a lot of political drive behind not only from the Canadian government but also the United States who wanted easier oil access on the west coast. The United States was in the middle of the Korean War and wanted to have more secure oil contact. The pipeline had a lot of resistance from other environmentalist groups because it ran through areas that would later be named national parks. However today, there is another pipeline that is being proposed by Kinder Morgan that runs almost parallel to the pre-existing one. The intent of the new pipeline is to bring more oil to the west coast of Canada in order to keep up with the growing oil market in Asia. The new pipeline was approved by British Columbia in January 2017 but the decision immediately faced resistance from the public. Many people are skeptical of a new pipeline because of Kinder Morgan's track record with spills in the past. A journalists from Vancouver writes "British Columbians will continue to fight this decision in the courts and on the streets well past next spring's election." This pipeline is a good example compared to the Mackenzie Valley Pipeline that is in a similar situation right now. There has been a new pipeline proposed there as well that is supported by the oil companies but many citizens and environmental groups are resisting it. "British Columbia nod to pipeline expansion." Oil & Gas News, January 16, 2017. Global Reference on the Environment, Energy, and Natural Resources (accessed May 7, 2017). http://find.galegroup.com/grnr/infomark.do?&source=gale&idigest=6f8f4a3faafd67e66fa023866730b0a1&prodId=GRNR&userGroupName=bucknell_it&tabID=T004&docId=A477938750&type=retrieve&PDFRange=%5B%5D&contentSet=IAC-Documents&version=1.0. "Kinder Morgan - EHS - Pipeline Safety." HOUWWWP1. Accessed May 07, 2017. http://www.kindermorgan.com/pages/ehs/pipeline_safety/default.aspx. References: Selgiman, Ben J. "Long-Term Variability of Pipeline±Permafrost Interactions in North-West Siberia." PERMAFROST AND PERIGLACIAL PROCESSES, 22nd ser., 11, no. 5 (2000). Accessed May 05, 2017. Shabad, Theodore. "Siberia Pipeline Crews Advance." The New York Times. September 21, 1971. Accessed May 06, 2017. http://www.nytimes.com/1971/09/21/archives/siberia-pipeline-crews-advance-western-europe-to-buy-gas-delays-are.html?_r=0. "Victoria Oil and Gas." 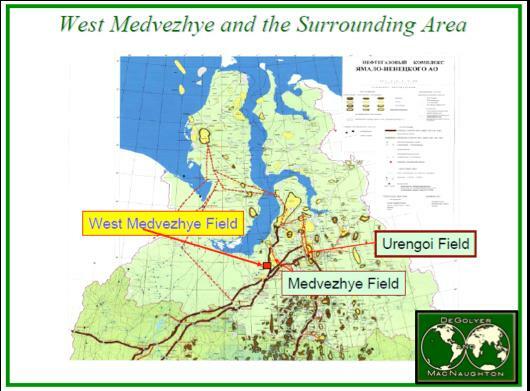 West Medvezhye Operational Update | Victoria Oil and Gas. July 07, 2011. Accessed May 06, 2017. http://www.victoriaoilandgas.com/investors/news/west-medvezhye-operational-update. West Medvezhye and Surrounding Areas. The Arctic is home to a plethora of resources; it currently produces one tenth of the world’s oil and one fourth of its natural gas. Commercial extraction of oil started in the 1920s in Canada’s northwest territories. In the 1960s, large hydrocarbon fields were found in Russia, Alaska, and the Mackenzie Delta in Canada. The last several decades have produced billions of cubic meters of gas and oil in these countries in addition to Norway. The Canadian Arctic holds 49 gas and oil fields in the Mackenzie River Delta and 15 are located on the Canadian Arctic archipelago. There are also 11 offshore fossil fuel fields that were discovered in Barents Sea between Russia and Norway. North of the Arctic Circle, mostly in western Siberia, more than 400 onshore oil and gas fields have been found; roughly 60 of these fields are notably vast while a quarter of them are currently inoperable. In addition to fuel sources, there are also extensive deposits of minerals in the Arctic, predominantly in the most developed part of the region, the Russian Arctic. It contains copper, silver, zinc, molybdenum, gold, uranium, tungsten, tin, platinum, palladium, apatite, cobalt, titanium, rare metals, ceramic raw materials, mica, precious stones, and some of the largest known deposits of coal, gypsum, and diamonds. The North American Arctic, on the other hand, holds iron, nickel, copper, and uranium. It is important to note, however, that many of the known mineral reserves have not been extracted due to the high cost and their inaccessibility. "Natural Resources / Arctic." / Arctic. February 21, 2017. Accessed March 08, 2017. http://arctic.ru/resources/. Seismic exploration camps are outposts of southern oil and gas exploration activities. They are constructed to shelter scientists during their surveys of the north in search of oil and gas resources. Geologists and related scientists set off explosions to induce waves underground. Theses waves 'echo' off the different layers of material allowing geologists to interpret if/where oil and/or gas could be located. Though it is considered a non-invasive way to see into the subsurface when compared to drilling test holes, creating the infrastructure to allow seismic exploration to take pace and setting off explosions takes a toll on arctic ecosystems. In his book Unfreezing the Arctic Andrew Stuhl "This method [seismic] required the use of several tracked vehicles in a caravan, setting off blasts and collecting the data from them, and gashing vast stretches of the Arctic landscape" (Stuhl 114). Legacy of this seismic exploration is felt today, as the scars Stuhl references still exist. Stuhl, Andrew. Unfreezing The Arctic. 1st ed. Chicago: University of Chicago Press. Print. How about when introducing a needle that registers .3-.45 below accurate. Start the ideal gas law tests at 12.05.